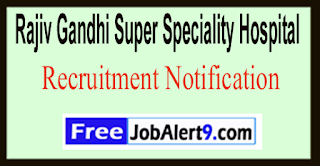 RGSSH Rajiv Gandhi Super Speciality Hospital Has Released Recruitment Notification For 154 Clerk, Technician, Medical Social Worker Posts. 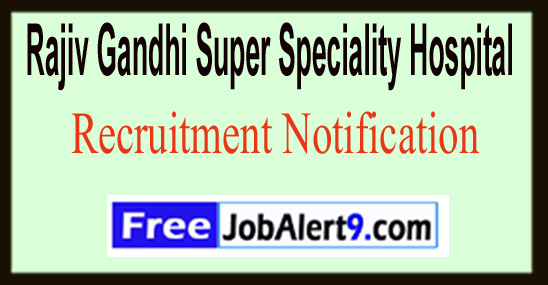 All Eligible & Interested Candidates Can Apply Online.Further Detailed Information Regarding Educational Qualifications, Age Limit, Selection Procedure, Exam Pattern, Syllabus for RGSSH (Rajiv Gandhi Super Speciality Hospital) Recruitment 2017 - 154 Clerk, Technician, Medical Social Worker Post is mentioned below. Age Limit - Candidates age should be between 18 to 27 -Years (Post 11).Candidates upper age limit should not Exceed 55 -Years (Post 1,5,6,8), 50 Years (Post 2,4,7,9,10), 45 Years (Post 3). Selection Process - All Eligible Candidates will Be Selected Based on Their Performance In Skill Test / Written Test . Pay Scale - Rs. 32,248/- (Post 1), Rs. 17,632/- (Post 2), Rs. 16,472/- (Post 3), Rs. 31,320/- (Post 4), Rs. 41,242/- (Post 5,7,9,10), Rs. 24,976/- (Post 6,8), Rs. 18,560/- (Post 11) . How To Apply - All Eligible & Interested candidate fill the online application through official website (http://www.rajivgandhisuperspecialityhospital.org) before / (5th June 2017). Dead Line For Apply Online - 05-06-2017. Click Here For RGSSH Recruitment 2017 Detailed Advertisement 1. Click Here For RGSSH Recruitment 2017 Detailed Advertisement 2.